Y'all, I don't know where the last month went. All I know is I rocked it. Or, I think I did...I can't really remember. Where does the time go? 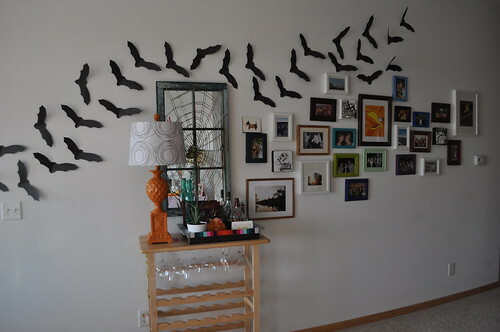 Anyways...even though I started talking about fall/Halloween decorating when last I wrote (which, again, was ALMOST a month ago...I have gotten really bad at this blogging thing), I just recently finished it. And that happened mostly because I offered to host a going away party for a friend at my place, so it had to look presentable. 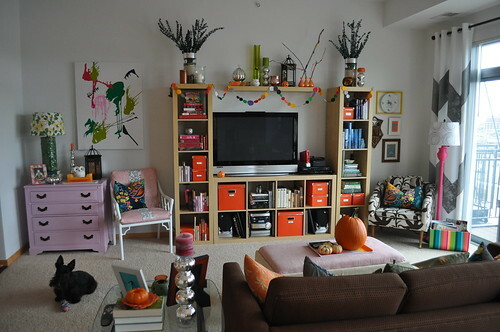 I got most of my decorating ideas from Pinterest. (Insert sarcastic surprised expression here.) 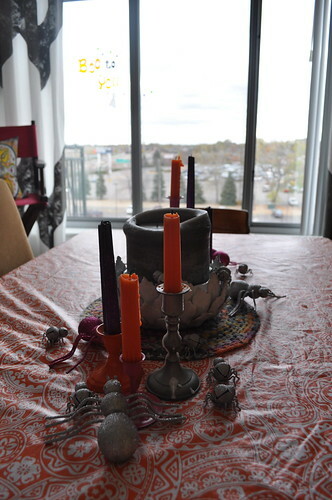 Originally I thought I would decorate for fall, with some Halloween accent pieces that could be removed when November rolled around. I made this fall leaf inspired garland to hang above my TV and over the desk area. 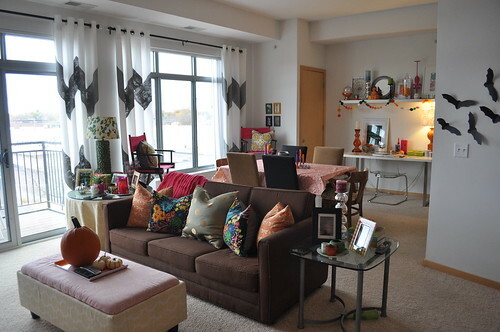 But after living with it a few days I decided I really wanted to just go all out with Halloween for now. So I did, because I do what I want. And I made a new banner...but don't worry, I worked way too hard on that leaf one for it not to show up in November. There are lots of pumpkins in this picture - 9 to be exact. But only 1 Emma. Notice that my dining room chair covers didn't happen. That project is like, really really hard you guys. However, this look is just as bad so I need to do something soon. I pretty much loved that blogger's festive style and decided I wanted some of it. Or, pretty much all of it. Her garland was so genius that I'm kind of mad I didn't think of it myself. 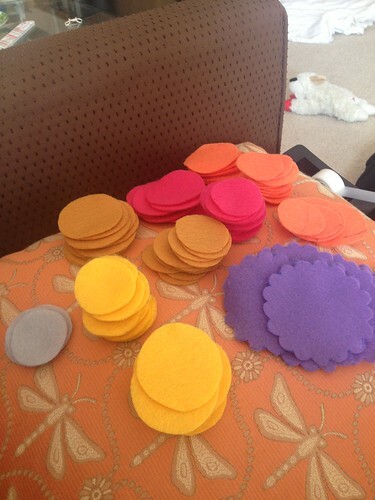 Plus, it is super easy and CHEAP because felt is almost free (30 cents a piece what what?!) at the craft store. But, it did require cutting out lots and lots of circles. And then some more circles. I watched TV while cutting so I didn't notice the fact that my hand had cramped into a claw shape...as much. 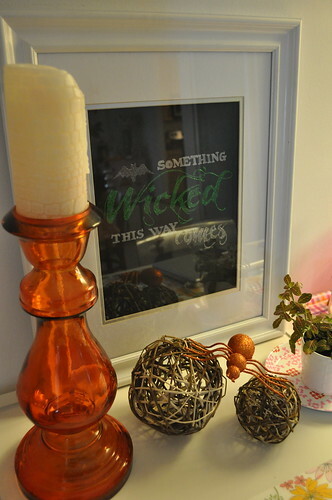 In addition to having lots of pumpkins everywhere, I also have lots of sparkly spiders. There are green and blue ones in the kitchen climbing on things. There are silver and pink ones on the dining room table - along with some festive taper candles I stumbled upon at Michael's 40% off. 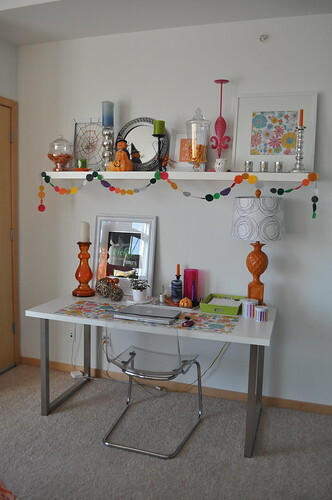 And there are orange ones in the desk area - which is where I got the most festive and even changed out the artwork. The smaller spiderweb on the left is what inspired me to try it on the mirror on the gallery wall, because it just looked so darn cool. And it was so darn easy. Plus, it was another way to use some of the awesome yarn Kayla gave me for Christmas. Yarn that I thought I lost shortly after Christmas. But it turns out it just fell out of one of my bags when I was staying at Emily's and rolled under something, which is where she found it in May. And then she told me about it a few weeks ago and it was like Christmas all over again to get that leftover yarn back. I also found that design on the interwebs and then I just traced that onto a bigger piece of craft foam and filled it in with glitter puffy paint. It turned out way better than I ever thought it could, which is just a testament into how skilled I am with glitter puffy paint. I can only attribute this talent to my Mamsie - who had me using puffy paint to trace and accent appliques that we ironed onto sweatshirts, at like the ripe age of 7. That's 22 years I've been working with the puffy paint medium, and believe you me, I'm a pro. This art is legit. Welp. That's how I decorated for Halloweenie this year. Since "breaking the seal" of holiday decorating I don't know that there will ever be a time when I am not putting up some kind of holiday decoration. And I wouldn't have it any other way. Everything is so cute!!!!! I love it all .... the garland, glittery spiders, the sayings, the cobweb on the ole mirror. Geez La you got this decorating thing down! You rock! !